That’s what my sewing room is today – pinbasting central. Finally, my niece’s wedding quilt is basted and ready for quilting. This one is queen size. It’s been a while since I’ve machine quilted one that large – don’t think I’ve done one since I got my new machine so the extra harp space should come in very handy working on this. My original thought was to stitch in the ditch along all the framing sections and then free motion quilt within the blocks but I may take the easy road and just fmq a large meander over it all. Still contemplating what I want to do. As long as the table is clear and there is batting at the ready, I’m going to see if I can’t get a couple smaller items pinbasted today too. Time to go play among the finished tops and see what I can find in there and go see what I can find in the stash for backing them. I need to get some of these tops quilted — especially since I did a bit of moving around of fabrics in this EQ design and decided I liked it like this. 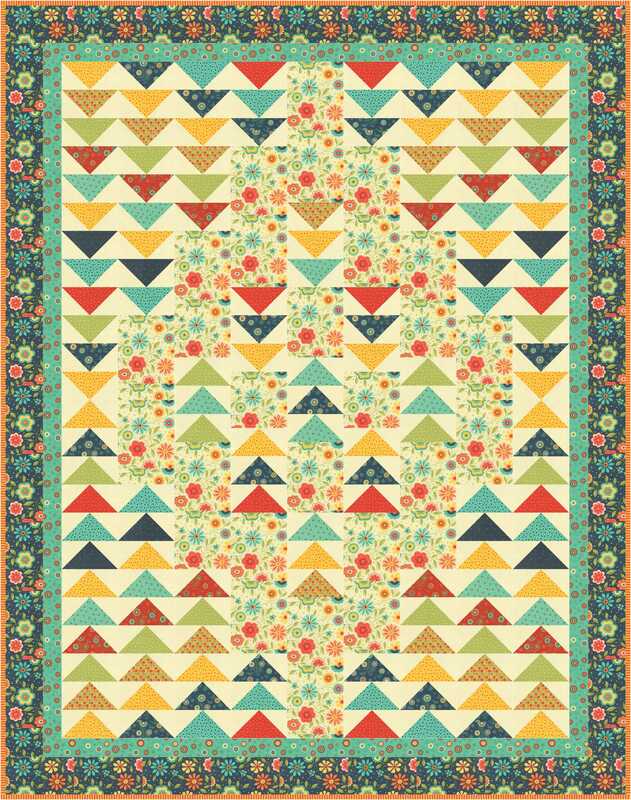 I’m calling this version “Block Party Picnic” since it is shown in the Moda Block Party fabric line and it just looks like a happy quilt you would use on a picnic. I grew up in a village of 500 people and I remember the block parties we used to have. It actually included several blocks of neighbors and one of the streets would get blocked off and the Dads and boys would go collect all the picnic tables from everyone’s houses and set them up in the street right next to a neighbor who had a huge yard where baseball and other games would be played. 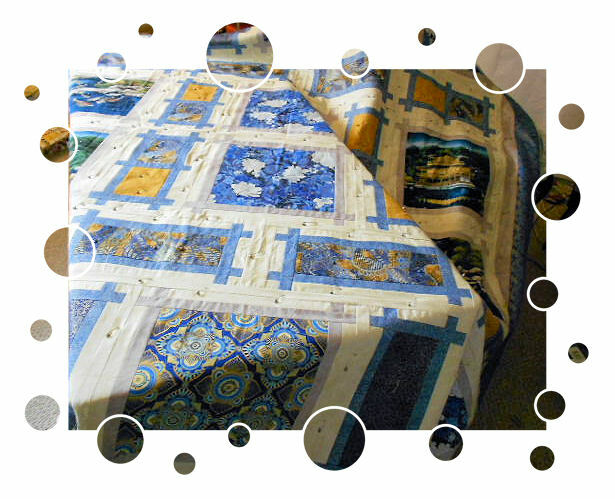 Our picnic quilts were usually tied quilts Granny made. Anyway, I just may have succumbed to the calling to me of this fabric line and ordered some to make this. Anyone else interested in stitching a version of this design? It’s super easy of course – lots of flying geese but they are large so not as putzy to make (or at least I think the smaller they are the putzier they are to make). As shown with the borders (I made them wider/added a second one on this version so it’s a bit large than my original Diamond Formation challenge quilt), this one is, I think, I nice large throw measuring 66″ x 84″. So if there’s enough interest to stitch along with me one of these weekends, I may be convinced to write up the instructions. 🙂 It would be great stash buster too since there’s lots of 1/4 yard fabrics or it would be even more scrappy. I would love to make it!!! I have to overcome my stubborness of not wanting to make flying geese. Here is my chance! Count me in on this one. Just my style – scrappy! I am ready as well.what is another work in progress? Would be fun to make.And I do have considerable stash that needs busting!!!!! I’m ready for another sew along. And the Block Party Picnic would be a great one to do! I really like this latest version. I love the Block Party Picnic quilt. It looks so fun with all the flying geese. Have a great holiday weekend.